Vinyl collectors spin with disbelief. 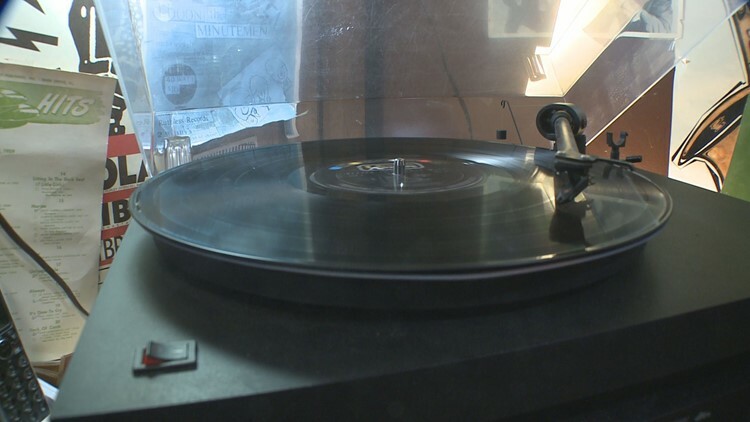 DECATUR, Ga. — A bill in the legislature is getting some heat from record collectors for describing a phonograph as “anachronistic.” That word describes something as outdated, and record collectors say the machines that play vinyl records are far from anachronistic. The bill is the very first one sponsored by state Rep. Josh McLaurin (D-Sandy Springs), who was first sworn in five weeks ago. The bill takes on the phonograph, a machine invested by Thomas Edison in 1877 - yet it persists in 21st century culture. The evidence is in Wuxtry Records, a north Decatur institution opened in 1978. Yes, some people still buy music at Wuxtry and other store and its owner Mark Methe is quick to point out they still buy vinyl records. McLaurin, age 31, says he listens to music on a computer. He says the bill cleans up a state law penalizing people for obliterating serial numbers from certain machines. The bill exempts as “anachronistic” dictaphones, comptometers, adding machines and yes, phonographs. The bill would have no impact on the sales of phonographs or on the legality of people possessing and using them. “These terms that we’re trying to get out of the bill, comptometer, phonograph, adding machine, are items that just aren’t in general use anymore,” McLaurin declared. Unless you go to Wuxtry. “We’re playing this Traffic record on a record player, a phonograph player,” Methe said, as the vinyl record spun at a rate of 33 and 1/3 revolutions per minute, emitting the vintage music through a stylus attached to an amplifier. Wuxtry has three phonographs in its shop. The antique in the back is a bit anachronistic, a machine hand-cranked and without any electrical power. But Methe says the others get plenty of use from customers and staff, and that about half of his sales are vinyl records, playable on phonographs. “It’s a big market and it’s completely up to date and modern. There’s new technology for record players. So in no way are they obsolete,” Methe said. Nearby, John Robinson was browsing Wuxtry’s vinyl inventory. “My newest turntable is about two months old,” he told us. “I do have friends about my age who do collect vinyl,” Rep. McLaurin said, in response to a question. He contends his use of the word “phonograph” in the bill applies to the antique in Wuxtry’s back room, not to the electronic phonographs in use in the front of the store. McLaurin says his first-ever bill in the legislature is more about updating the law than it is about whether the phonograph itself is anachronistic.